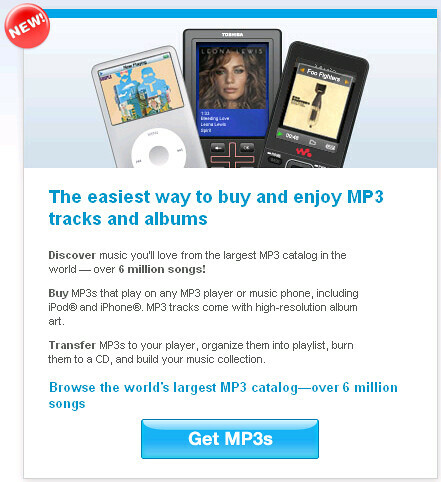 In what can only be described as an amazing irony, AP is reporting that today, Napster will begin offering its complete catalog of over 6 million music tracks in DRM-Free (aka unprotected) MP3 format. At first glance, Napster's store isn't very well done. And add to that the fact that their subscription model where you pay $13 a month for all you can rent music is still their main business. Still, it's the fact that the music industry has gone full circle on the concept of DRM-Free music that is somewhat amazing to me. While we're on the topic of digital music, I wonder why people are still buying DRM'd tracks when there are DRM free tracks available? I'm purchasing all of my tracks from Amazon right now because they are DRM-Free. ITunes won't get any more of my business until they are competitive on DRM-Free digital music.